Passing a billboard that read "Cafe Risque: We Bare All," a Toyota Corolla headed north on Florida's Highway 75 toward Gainesville. The driver and the front-seat passenger were twenty-somethings. The passenger in the backseat was a sixty-something: me. Anyone peering inside our car might have assumed that I was a grandmother traveling with my grandchildren. In fact, I had only met the two young women an hour before in a classroom on a college campus in St. Petersburg. All of us were taking a class entitled Florida Springs. My road trip companions were undergraduates seeking degrees in environmental science. I was a senior auditor in the class (which means I wouldn't be doing any of the homework). 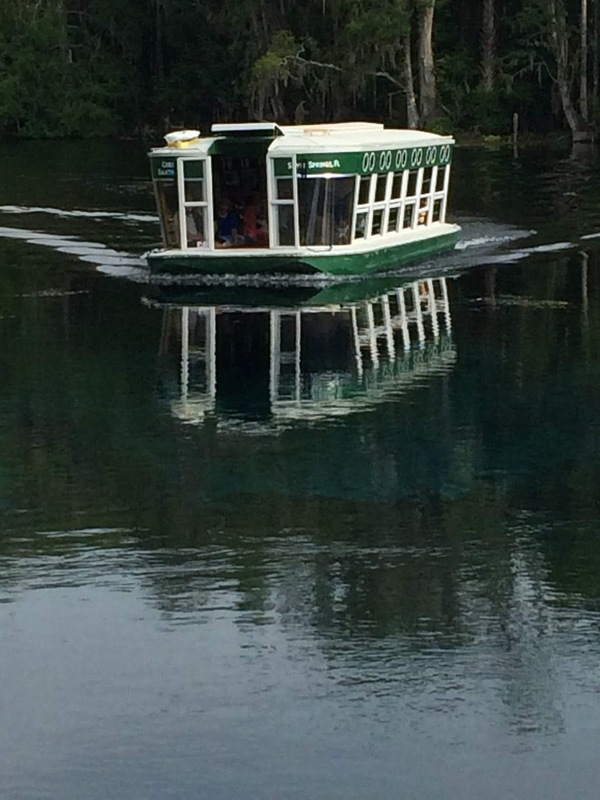 Taught by USFSP Professor Christopher Meindl, the summer session consisted of only four meetings, on four Saturdays in May, June and July, each time visiting springs in a different part of Florida. 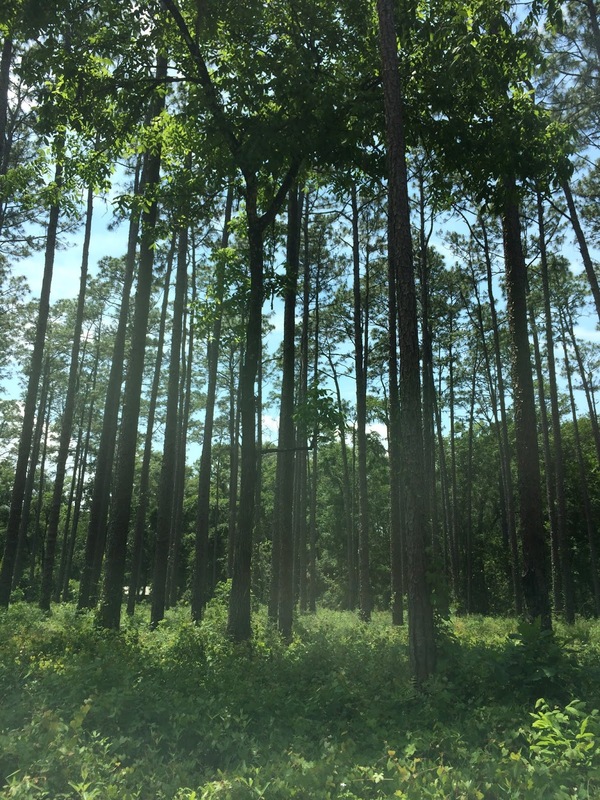 This first field trip was to springs in Northern Florida. Back on the St. Petersburg campus that morning, the driver, a woman, with long, blonde hair tied back in a bun, had announced that she had room in her backseat for anyone who wanted to join her and her friend for the trip north. I jumped at the chance to be chauffeured to the sites rather than try to drive on my own. "We're off like a dirty shirt," I announced when we took off. That, I had explained, was what my mom always said when our family started on a trip together. "That's funny," one of my road trip companions said. "My dad used to say, 'We're off like a prom dress.'" Ah, the first hint of a generational shift. As soon as we cleared Tampa traffic and began to see signs for Ocala, the two twenty-somethings decided that they needed a jolt of java. Consulting their electronic devices, they located a Starbucks in a nearby mall. We took the next exit off in search of coffee. After our Starbucks stop, we got back on the interstate. Passing a billboard illustrated with babies that read "Pregnant? 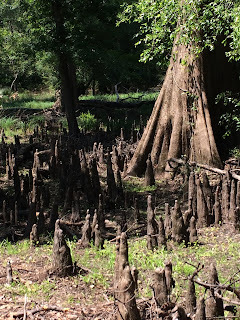 18 Days After Conception Are Hearts Are Beating," we headed for our first springs in a state park cryptically called Devil's Millhopper. It was near Gainesville. We had several hours of road ahead. The two women in the front seat had met each other and bonded in a class the semester before and now were fast friends. All the way to Gainesville, they chatted non-stop. They talked about the environment (both care deeply about the natural world); college internships (both are doing internships this summer; one will be studying sharks); politics (both are faithful followers of John Oliver and loved Jon Stewart), and the value of exercise. "You are my hero," the driver told her friend, a rosy-cheeked brunette who looked like a marathon runner, "because you get up every day and work out for an hour." The brunette talked about her husband whom, she pointed out, was "much older" than she. He was 28, she told me, when I asked. The blonde talked about how excited she was to be moving into a house near campus. She was contemplating furnishing her tiny bedroom with a hammock and a futon. She would sleep in the hammock and use the futon when she needed a bed for two. The ride clearly was going to be as much of an education as the class. Being able to observe the generation now entering and attending college has been one of the perks of auditing classes at USFSP. I never had children and I live far from my siblings and their offsprings, so these encounters have been rare occasions for me to meet Gen-Zers (or Post-Millennials, as some call them) up close and personal. It has been an eye-opener. These young men and women live in a world that is far more diverse than the one I knew growing up. They appear to me far more comfortable in their own skins, far more tolerant of each other's differences than many of us were. They treat each other with more equality and respect than I remember men and women doing in my classroom settings. I will never get used to their speech patterns, however, especially the way they make the end of declarative sentences sound like a question. (Kevin McGeever, a former St. Petersburg Times colleague, complains that they use the word "super" as a modifier for everything.) They often make me feel old, not because they are ageist, but because they are so deferential to me. But they also are more polite to each other than my contemporaries were. Their slavish devotion to their cellphones at first makes me think they are as empty-headed as Valley Girls, but when I listen to what they are saying, I am often impressed. They generally are thoughtful and, as they might say, super aware of what is going on in the world, thanks to those handheld devices. Many of them are fierce environmentalists. They are going to have to live with the consequence of climate change and they know it. When we reached Devil's Millhopper, again thanks to those ever-faithful handheld devices, we entered the park through a hauntingly beautiful pine forest. 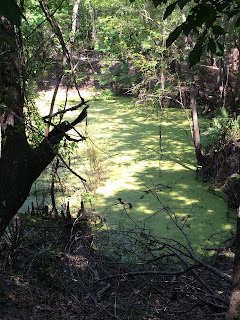 We were at the park to see a 120-feet deep sinkhole, fed by 12 springs. Tourists usually are able to hike all the way down to the bottom of this bowl-shaped cavity, but last fall Hurricane Irma washed away all the wooden staircases that provided access. The more hearty among us were disappointed by that, but I for one was content to merely peer down into the hole from afar and imagine those bones of animals in its depths that give the park its satanic moniker. The hopper part of the name is a nod to the area's grist mills. 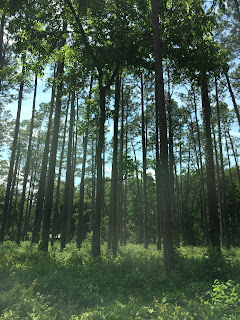 Our next stop was O'Leno State Park. That name is a contraction of Old Leno, a town that became a ghost town when the railroads came to Florida. Once in the park, we staggered across a suspension bridge built by the Civilian Conservation Corps in the Thirties and picked our way along the river bank through a forest of downed trees and clusters of cedar knees, finally arriving at an expanse of water where the Santa Fe River, literally disappears underground. 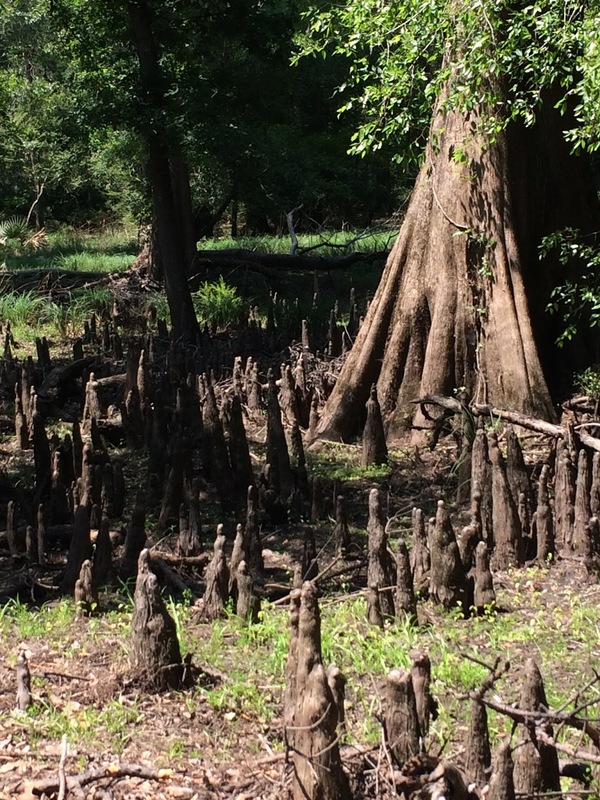 The "natural sink" takes the waters of the river down through a network of caverns, only to resurface again three miles away in River Rise Preserve State Park. 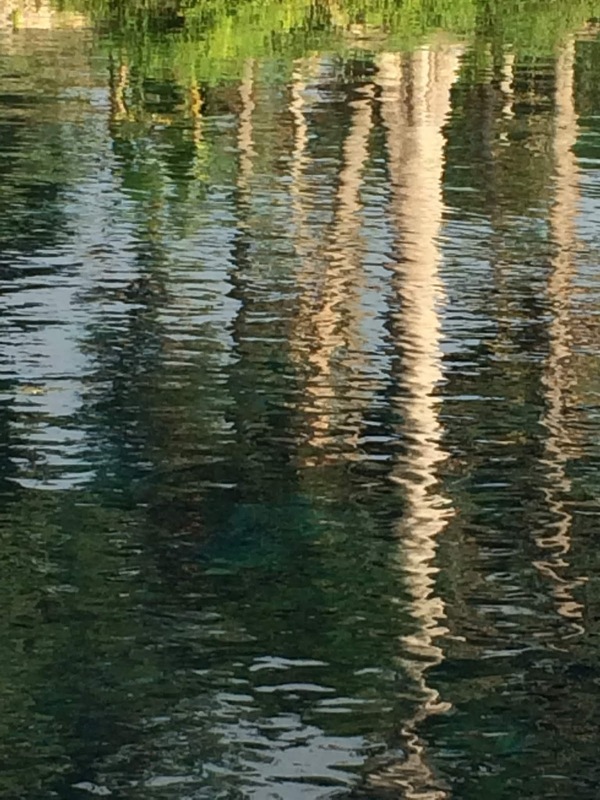 Our last stop was Silver Springs State Park in Ocala, the site of one the largest artesian springs ever discovered. Once privately owned, the spring was Florida's first tourist attraction. Famed for its Glass-Bottom boat tours, visitors have been coming to the park to marvel at the clear, turquoise waters since the 19th century. Now the tourists share the space with feral rhesus monkeys. Signs warned us to beware of them: State officials consider them a health hazard (they have tested positive for Herpes B). Most likely the monkeys were introduced into the park in 1938 by a boat operator who wanted to add flavor to his Jungle Cruise ride (and not, as it is sometimes reported, by movie producers who filmed a Tarzan movie in the area in 1939). 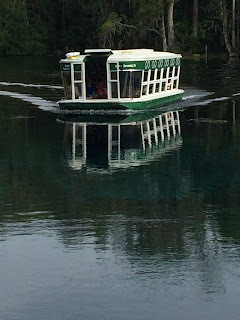 Most of the students in the class went on a hike in search of those monkeys, but a few of us -- post-millennials and baby boomers alike -- stayed behind to stare at the eerie reflections of the glass-bottom boats and tree trunks in the park's clear, turquoise waters and try out the white rocking chairs thoughtfully set along the water's edge. No generational bias here. The springs in Florida are dying. All the places we were scheduled to see in our class were in danger. "The water in many springs no longer boils up like a fountain, the way they have for centuries," Pittman wrote six years ago. "The flow has slowed. In some places it has even stopped or begun flowing backward." The water that was coming out was polluted by nitrates, a pollution that fuels the growth of toxic algae blooms. Those blooms not only were choking the springs, Pittman warned. They were a health hazard. 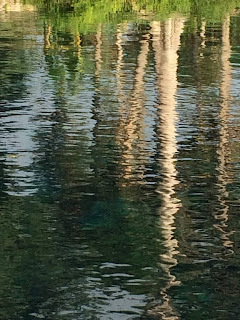 Even worse, the fresh water coming out of the springs was showing signs of a growing saltiness which meant the limestone on which the state's fresh water supply lies was being breached, putting the whole of Florida's fresh water supply at risk. "We don't care. We say we care. We give it lip service. But we don't care," David Still, an engineer specializing in hydrology, told Pittman. Still, who was a former director of the Suwannee River Water Management District, blamed the over pumping by utilities for the springs' decline. "The laws have allowed the degradation of those springs, and I don't think we as a society are going to get it changed." Now, six years later, the situation is even worse. Is there still no one around to "get it changed"? On my next road trip with the Post-Millennials in June I plan to tell them I am counting on them, counting on them to be the generation to save Florida's sharks, to save Florida's springs, to save Florida's fresh water supply. "Okay," I can hear them reply, their voices going up into a question. "No pressure."